Ideal Canada 2 Nib n1087, can anyone give me any info on this pen? is the #2 ideal Canadian still flexy like a a ideal 52 #2 nib? 2 or 2A is the nib size, it bears no relation to the flexibility of the nib. They were made from super stiff Manifold to long tined super-flexies. Are the 2 and 2A nibs/feeds interchangeable? Penman88: I recently acquired a Canadian that looks like this although with a slightly different color and an improper nib. 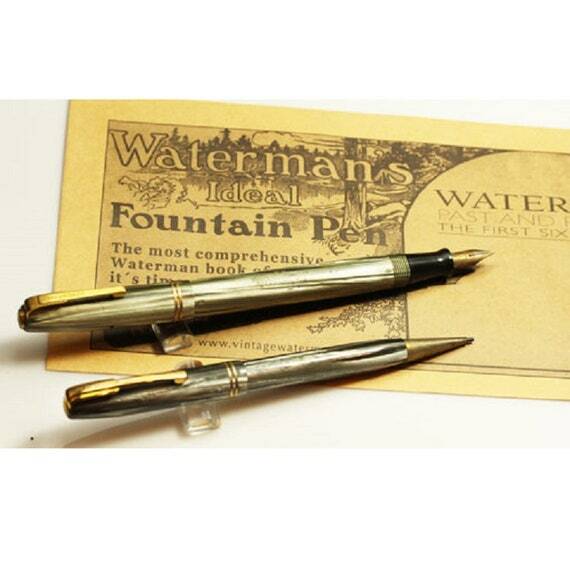 The pen is called a "Stalwart" and confirming the ID should be easy with that name. It is a Canadian-only version of another pen almost identical to it. The one difference being the double ring on the cap. Not being an expert by any means, I thought I'd just share mine looks a lot like that. Hopefully someone smarter can confirm or educate me as well. I am now on a hunt to get a replacement nib/feed for that pen, which is why I was wondering about the 2/2A nib interchangeability. eharriet..while poking around in the catalogs I saw the Stalwart in the 1947 catalog.. couldn't see which nib was on it but likely same as on the open nib pens of the taperite era..they have a larger diameter feed than the old Ideal 2's had ..
Edited by GlenV, 02 March 2019 - 18:05. Hmm, that’s interesting. I plan on taking that pen with me to next Pen Show opportunity I get to see. Hopefully I’ll be able to test and see if I can find something that works. I have an open nib Taperite. Maybe I can do a comparison. OK, I'd been trying to find a "Max Davis" on Etsy and I have no idea who this is. Have a shop name? Edited by Freddy, 05 March 2019 - 22:18.